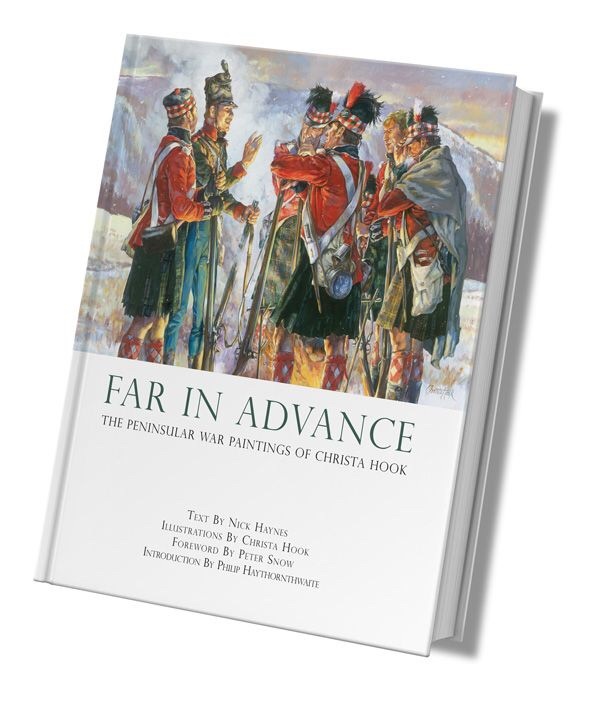 Book Review: Far In Advance, The Peninsular War Paintings of Christa Hook. “Thus the war terminated, and with it all remembrance of the veteran’s services”. Those were the words written by W.F.P Napier to describe the end of the Peninsular War. The great chronicler of this defining conflict perhaps never wrote a more timeless phrase. Thanked in typically Spartan fashion, though with genuine feeling, by the Duke of Wellington the Peninsular Army faded into obscurity barely months after the peace of 1814 was declared, and much to the chagrin of the old sweats who had toiled for six years through Spain and Portugal, they were almost obliterated from national consciousness by the Battle of Waterloo. In his memoirs Sir Harry Smith identified the great curtain call of 1815 as the reason why the “Spanish Army” was so neglected in memory. Luckily 200 years later there are still those who strive to redress this. Authors like Phillip Haythornthwaite, Charles Esdaile, Peter Snow and artists like Christa Hook. Christa has been painting the soldiers of Wellington’s Peninsular Army for 10 years, which has given her a feeling and insight unmatched for her subject in the field of British military art. Only in America does one find a parallel in artists who devote substantial bodies of time to specific periods like this. It brings to mind a quote by Meissonier about Lady Butler, “England really has only one military painter- a woman”. Of course neither Butler, nor Christa is alone, the Master had exaggerated for there was Beadle and Wollen, and today a host more who recreate battles of times gone by, yet to my knowledge she is the only military artist today that has put so much work into depicting the British soldier in Portugal, France and Spain. Those of us who enjoy Osprey Publishing titles will be no stranger to the name Hook. I quite vividly remember a few years after its release, buying Haythornthwaite’s Campaign book on Corunna and marvelling at the artwork inside, and then looking at Mark Urban’s book “Rifles” and saying “Oh he got Christa Hook to do the cover”. Still less hard would be to have any interest in military art and not know the name of her father, Richard, whose work I remember adorning not a few childhood illustrated encyclopaedias and regiments of Osprey titles. Accompanied by an accomplished text from Nick Haynes, a Foreword by Peter Snow and an introduction by Haithornthwaite, this slim, high quality coffee table book is filled with over 20 paintings by the artist and a number of smaller studies, at the end is a very interesting part describing the process that went into creating them. 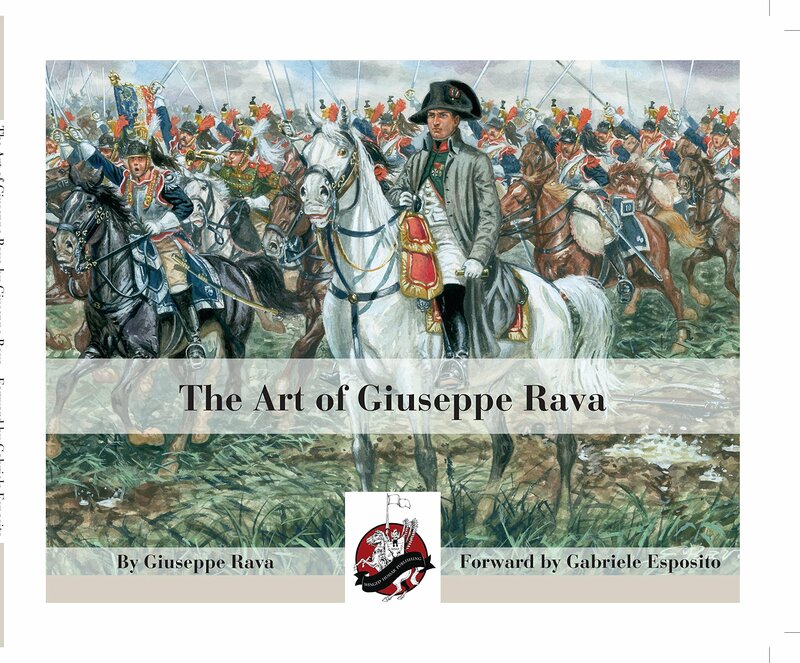 It has a tasteful cover design featuring artwork shown in the book and is a gem for all history lovers, especially if they have a soft spot for this campaign. Opening it is a visual feast of rich colour, exiting movement and action and many thoughtful compositions that illustrate perfectly why for some of us Waterloo is just a full stop to a much longer sentence. I never thought a book like this would be published about the Peninsular War. I have seen quite a few done by American artists about the Civil, Revolutionary and yes Napoleonic wars as a whole. These from artists like Rocco, Kunstler and Troiani, even going back in time, Detaille’s L’Armee Francaise is just as much an art book as it is a record of the French army, but I doubted anyone was painting the peninsular war to the degree necessary to compile a book, unless of course it featured Sean Bean. Rarely do I get to review a book principally on its visuals, and I could simply just say that it is a thing of beauty, but I will not be doing Far In Advance justice if I did. For there is the images of our minds eye right before us, the images we wanted to see in history books but never did. There is the 97th advancing at Vimiero, the guns roaring above them and the French column below them. They are two ranks deep but look at the line of supernumaries, sergeants corporal’s and junior officers almost forming a third, with the drummers marching in sections and the Field Officers riding behind to oversee the advance. Just as it would have been. The bigger picture is even included as the left flank of the 52nd marches past their rear at the double, obliquely, so as to wheel onto the flank of the unsuspecting French. There is the charge of the 15th Hussars at Sahagun, that was the centrepiece of the Osprey Campaign Book, the wave of British cavalry breaking on the wavering ranks of dragoons, swords at the guard and yelling like furies. But then look a lesser known moment, the crossing of the Douro at Oporto, a scene never before painted in modern times, soldiers clamber into the local barges, making sure to carry extra ammunition boxes along with them and accept a bit of Portuguese hospitality before embarking. Then all of a sudden you are soaring above the Seminary as the garrison holds off the French counterattack from the windows and rooftops. One can almost hear the tumult of voices and gunfire in the painting of the action at Barba del Puerco, and the Battle of Fuentes de Oñoro is almost perfect in terms of it’s wide scale, so detailed as to be almost cinematic. There are many paintings full of noise and action, but confusion is a part of war and there is a real sense of this in “A deadly duel of Musketry”, “Retaking the Knoll” and “Stern valour.” No crisp thin red lines here, instead the ranks are disordered by enemy fire, casualties cover the ground, the troops themselves are moving about as they discharge and load their muskets. As a surprise we even get to see the scene from Hayer’s “The Spanish Bride” when Captain Daniel Cadoux’s position was overrun at the Bridge of Vera. But war is not just volley fire, Sabres and bayonets. It is marching, it is outpost work, sleeping rough or in camp, and often allot of waiting. These quieter moments are here as well. Men huddled around a fire listening to a story, a Hussar picquet testing the depth of a ford, a vedette reporting to the officer on duty, the funeral of a general under the crooked spire of a cathedral scarred by gunfire, the shadows of a gatehouse at the end of a winters day as an artillery troop rides in with the sunset at their back, a lone rifleman with set features that telltale gait of an aching back and sore feet, far in advance. The influence of her father, to whom the book is dedicated is now and again glimpsed, in the uniforms of the heavy dragoons charging the French at Fuentes. General Cruafurd’s uniform, and the central group of “Picton’s Orders”. Sir Thomas having neglected to remove his nightcap decided to leave it on directs Lt Colonel Douglas of the 8th Portuguese Line, a scene her father painted for the Osprey book Wellington’s Generals. I identify most with the picture of General Craufurd entitled “Revenge Sir John Moore”. It is one of those paintings that captures a moment that thought well known, would not normally be painted. At the Battle of Buçaco in 1810 Craufurd personally ordered his light infantry to repulse the French attack with the words or those to the effect of “Now! Avenge the death of Sir John Moore”. He turned to them and waved his cocked hat in the air and motioned them forward to victory. Most artists would have had him waving them on, but instead Christa chose something much better. There is Craufurd, “Black Bob”, the draconian taskmaster of the Light Division, one foot on his rock. He stands near a small windmill, two riflemen run past him, away from the enemy that cannot be seen except through Craufurd’s stern gaze which is directed downward with a stiffening sense of resolution. He has just decided that the time is right, and knows what he is going to do. Having planted his right foot behind him so his hips will turn he grasps his sabre and removes his hat. Snap! The picture is taken, just before he turns his body to the waiting ranks of the 52nd, one of whom has sensed the General is about to speak. His hat held soon to be flung out and raised skywards, his mouth curving to form the words that would make him a legend. This is surely how it must have looked. It is the very essence of military art, allowing the viewer to see, feel and think about what is happening, what has happened and what is going to happen. And it is one of the reasons you will never be disappointed with this book. Accompanying the art are detailed descriptions by Nick Haynes, a former member of the Rifles and a recognised authority on the war. Many of the paintings depict members of the light Division therefore he is well placed in his role. 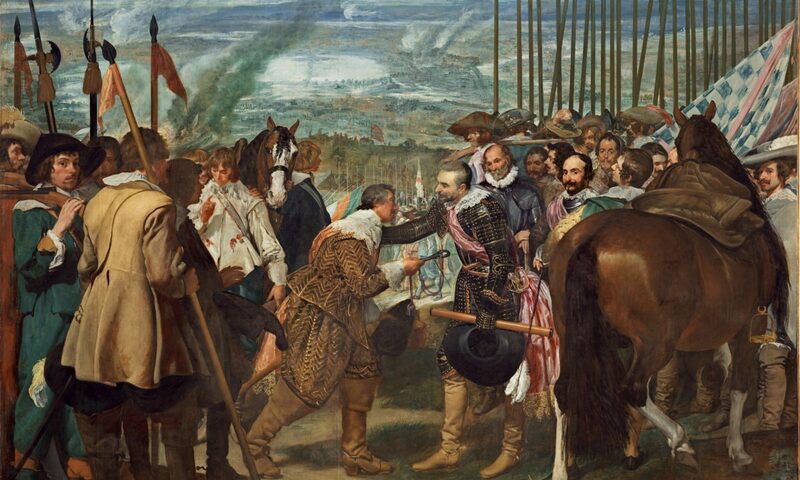 These are not intended to provide any coherent analysis of the war, but rather to put the paintings in perspective and give an explanatory narrative to the pictures. It’s well written, he takes care to defend the composition of some of the originally commissioned Christmas cards a little needlessly, for me he had no need to mount this defence, though given the picky nature of some Military History Buff’s this is understandable. He also spends a fair part of one description examining the character of General Craufurd, ultimately leaving it up to the reader to decide, though a larger book would be needed if you actually wished to answer that question. At the beginning and end of the book he draws attention to the legacy of rifles as the forbears of the modern infantryman. Peter Snow, broadcaster and author of two Napoleonic Books thus far, adds a stirring and heartfelt forward, and the admirable Haythornthwaite miraculously fits a detailed and readable description of the Peninsular War into his introduction. For every sale a donation is made to the Rifles Charities Care for Casualties campaign. Over 200 years ago the thousands of soldiers of the Peninsular Army were forgotten, not just in memory but in terms of care. It is a sad fact that Britain has never taken proper care of her soldiers. In two ways this book addresses these issues. Firstly by providing an ode to Wellington’s soldiers, and second by providing a means to support the soldiers of today. Master’s of Battle: Elizabeth Butler, part 3. Elizabeth Thompson writing to her father about the success of the Roll Call.